The following instructions come from the book With Pain and Love for Contemporary Man, which is a text of recorded dialogues between Saint Paisios the Athonite and his spiritual children. When inquirers and converts ask about how to make the first steps towards Orthodoxy, or even Orthodox who have been estranged from the Church for years, the advice given below are adequate and wise instructions to get the heart to be receptive to the message of Orthodoxy and the spiritual life of the Church. - Elder, when I feel my heart become hard like a stone, what should I do? - Your problem is not a hard heart but a mind-driven heart. Your entire heart has been taken over by your mind and is now at its service. But there is still a chance for your heart to go back. - Each day you must read a canon from the Theotokarion. If you want your heart to get back in shape, that's the best medicine. You do have a heart, but it has been clouded by logic. You are following the European "rubrics," the European way of thinking. You want to be true to form and do everything right. If you were a European clerk, you would be exemplary, always on time, impeccable in your duties, an example to follow. If you were to apply this integrity to spiritual matters, you would certainly make great spiritual strides and reach Paradise soon. But, you see, the European spirit with its logic is not heading to God but to the moon. Now you are behaving like a civil servant. Things are different in the spiritual life. What is needed is simplicity. Act with simplicity and trust in God. - How can I become simple, Elder? - I shall have to open your head and put an old-fashioned mind in it! You need to enter the simple world of the Gerontikon, and get to know the spiritual science which lifts and refreshes the soul, and gets rid of headaches. Logic will make us suffer. For example, I say to myself, "This must be done in this specific manner," and so I go ahead and do it because it has to be done. I don't do it with my heart but because logic dictates it. Logic and courtesy may tell me that "I must surrender my seat," but my heart will not. Think of the difference when my heart is moved and I surrender my seat out of love. I feel such joy! We should keep the self out of our actions. We should not act for the sake of our own comfort. This will keep Christ away from us. We should act for the comfort of others, and in this way we too shall be comforted. God will then find comfort in us and we will cease to be merely human; we shall become deified. But if we put only the mind in charge, everything will be carnal and human. Secular logic tires the mind and weakens the body; it constricts the heart, while spiritual logic expands it. When used correctly, the mind can spur the heart and help it. When the mind enters the heart and the two work together, our work is not anymore the work of logic and reason. Sound reasoning is a gift. But this gift must be restored and sanctified. - Elder, I don't have a heart. - You do have a heart, but as soon as it tries to act, your mind puts a muzzle on it. You must try to acquire the logic of the heart - faith and love. - How can I achieve this? The first step: go down to Thessaloniki and march barefoot in protest, so that people will say that you went mad; this way you will get rid of your mind. Blessed soul! You approach everything with mathematical exactness. What are you, an astronomer? If you stop thinking logically, you will be able to start working spiritually on yourself. - What should I study, Elder, to help me get rid of secular logic? - First you must read the Gerontikon, the Philotheos History and the Evergetinos. All these books are practical not theoretical. Their simple patristic spirit and holiness will help you remove secular logic from your mind. Next you should read Abba Isaac, and this way you will not see him as a philosopher, but as a man illumined by God. The Holy Fathers saw everything with the spiritual, the divine eye. Patristic texts were written in the spirit of God and it was in the spirit of God that the Holy Fathers gave their interpretations. Today this spirit is lacking and Patristic texts are hard to understand. People see everything with secular eyes and cannot see beyond that; they do not have the breadth of spirit that results from faith and love. Arsenios the Great used to leave palm leaves in the water, without changing it, and the water would have a strong stench. It is beyond us today to understand what sprang from that unclean water! "But I don't understand that," we hear some people say. They do not take the time to see if there is something there; perhaps something they overlooked. They simply reject it because they do not understand it. When logic gets involved, we will have a hard time understanding the Gospel and the Holy Fathers. Our spiritual sense is so altered, that our logic will prove the Gospel and the works of the Holy Fathers useless, and we will say things like, "All these years of asceticism and fasting have not done us any good!" This is blasphemy. Once a young monk, who lived in a Cell, came to my Hut driving a car. "My son," I said, "why do you need this car? It doesn't fit a monk!" "Why, Elder," he answered, "doesn't the Gospel say, 'Will receive a hundredfold, and inherit eternal life?'" I replied, "When the Gospel says, 'Will receive a hundredfold,' it refers to the things a person needs. But the state that best fits the monk is what the Apostle Paul means when he describes Christians as 'having nothing and yet possessing everything.' In other words, the monk has no possessions but he has virtue and this is why people will trust him with their wealth. This does not mean that we monks should have possessions!" Do you see how logic can lead one to the wrong interpretation? You must always remember that if we are not purified, if divine illumination does not come to us, our interpretations will be muddled and obscure. From With Pain and Love for Contemporary Man, pp. 248-252. 1. To feel like you have a hard heart should be viewed as a state where your spiritual life is at risk, since faith and love have their source in the heart. A mind-driven heart resists both faith and love. 2. The Theotokarion is a book of collected canons to the Theotokos which St. Nikodemos the Hagiorite compiled from various manuscripts he discovered in monasteries of Mount Athos. This book contains a total of sixty-two canons. Unfortunately, it has yet to be translated into English, though it is an essential text of Orthodox spirituality. However, there are other Canons to the Theotokos that have been translated into English, such as the Great and Small Supplicatory Canon, or the Canons to various wonderworking icons of the Theotokos. 3. Of course, logic and reason are gifts from God to humanity, when they are applied properly. But if they are used to undermine faith and love or the other virtues, and they impede spiritual growth, then they are misapplied and do not allow for God to have His grace work within us and through us, and our spiritual understanding is darkened. 4. Here St. Paisios is saying that reason follows the laws of nature and is best applied to disciplines like science, which at the most so far has taken us only to the moon. However, the spiritual life is able to work outside the laws of nature and will help us attain union with God, which is a feat far superior than landing on the moon. 5. 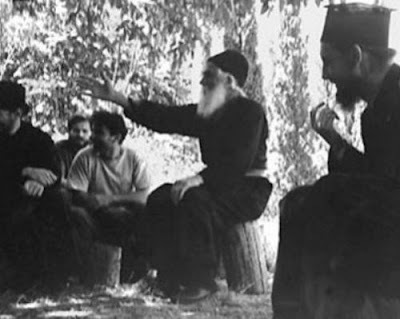 St. Paisios placed great emphasis on the necessity of having simple faith in God, and wrote a whole book on this subject titled Athonite Fathers and Athonite Matters. This book, which is a sort of modern Gerontikon, is available in English. 6. The Gerontikon is a book of sayings of the early desert fathers, who offered simple yet profound instructions on how Christians are to live the commandments of Christ with exactness. In English it is often translated as Sayings of the Desert Fathers. 7. Our Lord Jesus Christ calls the Holy Spirit "Comforter" in the Gospels for this reason. 8. St. Paisios seems to be joking here, but there is also truth behind the jest. To apply the heart to the spiritual life, you have to be willing to appear out of your mind, because you are pursuing things that are beyond this world where the rules of propriety in this world take a backdoor to a life of virtue that may appear beyond comprehension to others. 9. The Philotheos History is a text written by Theodoret of Cyrus in the fifth century in which he describes the lives of the holy men and women of Syria from his time. It is often translated as the Religious History or History of the Monks of Syria. This text is translated into English, with academic notes. 10. The Evergetinos is a practical text meant usually accompanied with the Philokalia, and was compiled by Monk Paul, the founder of Evergetinos Monastery, and published by St. Nikodemos the Hagiorite. It offers insights into the lives of holy men and women from the early centuries of Christianity on how to attain the highest ideals of the spiritual life. This text is fully translated into English. 11. St. Paisios, as well as many holy people of the 20th century, greatly venerated St. Isaac the Syrian, especially because he addressed in his writings from his own experience everything necessary for the spiritual life in a clear and concise manner. However, it is not recommended for immediate reading by St. Paisios due to the fact that there is temptation to read him academically and not as a way to apply what he says to your own spiritual life. 12. Abba Arsenios would only change the water for his palm leaves once a year, and would only add to it between that time. Monks would ask him why he did not change the water, because it smelled very bad. He answered them: "Instead of the aromatic perfumes I once enjoyed in the world, I must now endure this unpleasant smell." This Saying of Abba Arsenios can be read in the Gerontikon.